Welcome to Urquhart and District WRI - also known as Urquhart "Rural". We are part of the Moray & Nairn Federation of SWRI, which is a national organisation for women Scottish Womens Rural Institutes also known as "The Rural"
There are major changes affecting the Rural, Urquhart and District WRI is not happy about these changes and we support the facebook page "SWRI save the Rural "
We are a small friendly group of women who normally meet on the first Tuesday or Thursday afternoon of the month [we are flexible to meet the needs of our members], either in Urquhart Parish Hall or in members' homes or on visits to places of interest. Sometimes we meet in the evening but our visits to places of interest are usually during the day [and include coffee, lunch or tea, whichever is appropriate]. 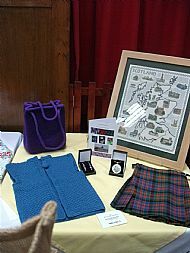 In the past we have visited gardens, gone to the pantomime, had a trip out into the Moray Firth on a lifeboat, had hands on demos in bread making, watched cookery demos, participated in a wide range of hand crafts, tried Tai Chi and Yoga, enjoyed musical entertainments and listened to talks and demos on a variety of topics. New members are always welcome, and because we are such a small group all the members serve on the committee and share in the decision making. Our members come from a variety of backgrounds and have a wide range of different hobbies and interests and our programme of meetings reflects this variety. Have a look at our site and our annual programme and if you'd like to join us or find out a bit more about us then email us on urquhartanddistrictwri@hotmail.com or phone or text on 07790967381 and we can let you know where to join us for our next meeting. We are very grateful to Spanglefish for allowing us to have this free website and we are sure you won't mind the advertisements which we agree to allow in return for letting us have the site.....by the way it is very easy to set up your site with Spanglefish.